Not spiderman. Not superman. Not cicakman. But Mask-man. 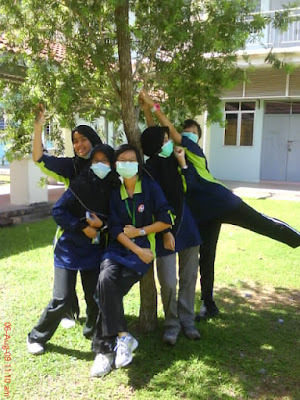 Everyone in KMK had become mask-man. Imagine yourself walking along the corridor flooded with people (Oh this is what i see every morning). IMAGINE YOURSELF WALKING ALONG THE CORRIDOR WITH EVERYONE WEARING A MASK ON THEMSELVES. The view is so magnificent. And not like we have to options. From what i heard, they are not gonna close down KMK as well as every single person wear mask where ever they go. And crap, i freaking spent more than RM40 on masks already. My stocks for next one or two months. LOL. See? Look so pro, kan? 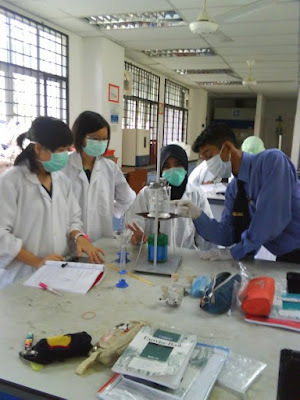 During Chemistry practical, anyway. Atie, EJ, Me. 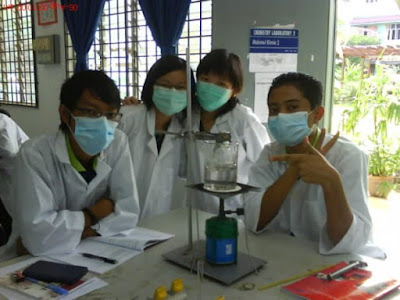 Lab mates for Chemistry. 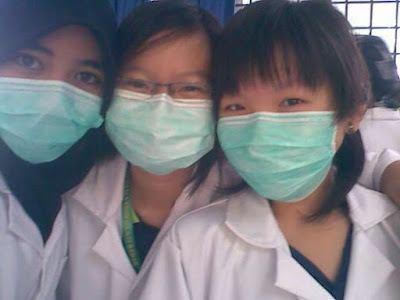 Camwhoring while waiting for the unknown liquid to vaporise completely. HAHAHAHA. Izzat, EJ, me, Redza. Still in the lab. This is such a niceeeeeeee photo! Azfa, Hana, EJ, Hanis and me. 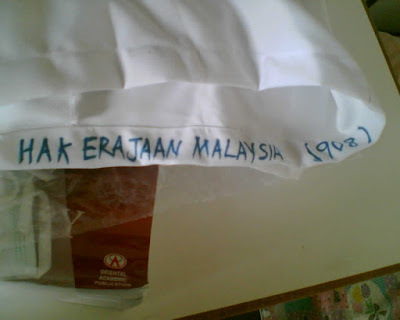 Don't ask me why is my leg terkangkang like this again (Look at my group photo for Moral Sketh and find the similarity!). Perhaps i just love this pose. LOL. Hope A(H1N1) can be over really soon. PLEASE! I can't survive long being confined in KMK for 7/24. I NEED SOME AIR IN....... the C-mart?!?! P/s: Pehge i love you i love you i love you. For borrowing your modem. Stupid CC with the spoilt wifi. Ughhhh. P/s/s: I'm too engrossed in online now, it is my dinner time now, i dont feel like eating even i'm hungry, i'm still smelly back from badminton, and i i still have clothes yet to be laundered. So WHAT AM I DOING HERE? Whatever.